In the matter of failure to provide Prisoners of War with proper medical care and food. Perpetuation of the Testimony of 1st Lt. Wallace Orville Northfelt, (serial # omitted). Q. Lieutenant, state your name, rank, serial number, permanent home address and telephone number. A. Wallace O. Northfelt, (information omitted). Q. What is the date and place of your birth? A. Minneapolis, Minnesota, February 26, 1919. Q. When and where did you last enter the United States from foreign service? A. LaGuardia Field, January 29 or 30, 1945. Q. What is the extent of your education? A. I was graduated from Bloomington High School, Bloomington, Minnesota, in 1937. I went to the University of Washington Night School for a couple of years during 1940-41. Q. State at what places you were employed as a civilian, the nature of each job and the period of time employed at each. A. I was employed at the Boeing Aircraft Company as a layout man for a couple years and before that I worked for a sash and door company as a machine operator for 1 year. Q. What group were you assigned to while you were overseas? A. 506th Bomb Squadron, 44th Bomb Group, 8th Air Force. Q. What was your primary target when you were shot down? A. Dornier Aircraft Works, Friedricshaven, Germany. Q. Were you shot down by fighters or flak? Q. Did you crash land or bail out? Q. At what places were you interned and state the approximate dates. A. I crash-landed March 18, 1944 at Dubendorf, Switzerland, and I was interrogated at the air force building in Dubendorf about the 18th. The 20th of March we were moved up to Neu Chatel, Switzerland and interned in a hotel there. 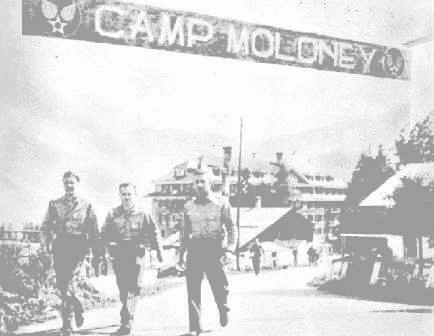 On the 14th of April of 1944, we were moved to Adelboden, Switzerland and interned in the Camp Maloney camp. On July 10th, I left Adelboden and was interned in an internment camp located at Davos Platz, Switzerland. About September 26th three (3) other men and myself took off to try to escape to allied-occupied territory. Five (5) or six (6) days later we were picked up trying to cross the frontier below Geneva by the border patrol. I was taken from there to a military prison named Copettes in Geneva, Switzerland. We stayed there approximately six (6) days and on or about the 6th or 7th of October 1944 we were moved to Straflager Wauwilermoos. Around the 6th of December 1944 I was released and taken back to Davos Platz. About a week later armed guards took us and moved us to Les Diabluet (actually Les Diablerets) internment camp. On January 3rd, 1945, Lieutenant Northfelt and his crew and myself escaped Les Diabluet and due to a mixup we got stranded on the top of a mountain and we sought refuge in a Swiss chalet with two (2) women and an old man. The night of January 5th, 1945, we made contact with the underground and were helped to cross the Swiss frontier and got in France at 0200 January 6, 1945. Q. State what you know of your own knowledge about the failure to Provide Prisoners of War with proper medical car and food. Tell us about your food at Adelboden. A. The food at Adelboden consisted of a piece of ersatz black bread about equivalent to two (2) slices of our bread and some chicory coffee. We could have as much of that as we wanted if we could stand to drink it. Q. What did you have for dinner? A. Usually potatoes and about once a week we’d get a piece of fish about the size of a piece of bread. Probably once a week we’d get some meat too. We had the same ration as the ordinary Swiss civilian did which amounted to very, very little. The meat was about 2” x 2-1/2”. Then we had chicory coffee for dinner too. For supper we’d have potatoes and if that wasn’t the main dish it was spaghetti. He had one (1) slide of bread for each meal. In case blood sausage or tripe was served, we would have as much as we wanted because nobody would eat it. A. We used to get a quarter loaf of bread, a lb. loaf of bread, and it had to last all day. For breakfast we’d usually have chicory coffee. For dinner we’d have Kartoffel (potatoes) and once in a while thin soup and that was again where we got tripe and blood sausage when we had mean, which was very little, and we usually got one (1) blood sausage about the size of a Bratwurst 4” long and 1-1/2” in diameter. Usually we did have as much of this as we wanted because the other fellows couldn’t stand to eat it. For supper we got Kartoffel (potatoes) and tripe and blood sausage, but when the Foreign Minister was down to visit us, then we got good meals. We had chicory coffee to drink. Q. What about your food at Copettes? A. They had it in a dirty, filthy sack and they would give us a piece of bread and sometimes it was green and moldy. It was equivalent to a slice of ours. Then you’d have chicory coffee for breakfast. For dinner you’d have potatoes and another piece of bread and non-eatable soup. I don’t know what kind of coup it was. At another meal we got what they called celery soup, but the celery was black and it tasted sour and rotten. For supper we had potatoes and probably another slice of bread and coffee. The way it was served, they’d open a door and shove in a kettle and, of course, all the Italians and Russians would dive in head first and it was our own initiative to get what we wanted. It was just like feeding a bunch of hogs. Everybody grabbed like mad to get it. We did have some tin plates, knives and forks. Q. How much weight did you lose while you were an Internee? A. I lost forty (40) pounds. Q. Did you ever get away from the table hungry? A. I never did sit down to a meal where I was completely satisfied with the meal and if it wasn’t for our black market enterprises we could arrange, we would have gone down farther in health than we did. Q. Tell us something about the ferocious dogs at Wauwilermoos. A. The guards had these ferocious big military police dogs and they were usually outside the fence. In cases where we were brought in for questioning, they’d come along with that dog and one day in particular, I noticed we were coming along and this dog was doing a lot of growling and jumping at us and one of the guys said something about the dog and had his arm up and the guard siced the dog after him, but he didn’t get hold of him. Q. Did the internees ever antagonize the guards to have them sic the dogs on them? Q. Did the guards ever sic the dogs on the internees? A. On that one instance that I know of. Q. Just for amusement of the guards? A. The guard wanted to show us his authority, more or less, and he wanted to show us what he could do. Q. What about the firing of rifles and machine guns at internees that tried to escape? A. At different times we tried to escape and they’d jump over the fence and the guards would let go with machine guns and rifles. Q. Were any of these men ever hit? A. I don’t know about that. Q. Did you ever require any medical attention while you were interned? A. When I was in prison I was full of sores all over my body and I needed medical attention, but you were foolish to even ask for it. The one (1) doctor that was assigned to take care of us internees was a sixty five (65) year old woman’s doctor. He specialized in woman’s cases and that’s all he did. He was assigned to us and he know about as much medicine as I did. Q. How many men required medical attention while you were there and what diseases were prevalent? A. Mostly chronic stomach disorders. One man died. Lt. Cass Smith was operated on three (3) times within a week for stomach disorders and he died. I don’t know what group he was attached to but he was a navigator. Q. Tell us about the medical care you received in general for any sickness at all. A. I had trouble with my prostrate glands. I went to the doctor and he was this sixty five (65) year old doctor and he puttered around and I went a couple of times, and he wasn’t doing anything for me so I proceeded to drink a lot of water and I got over my troubles. Q. Did he give you a negative report on it? A. He never gave me any report? I don’t think he knew what he was doing. He never gave me any medicine. He took some slides and looked through a microscope, but that’s all. Q. What did they do for your skin diseases? A. Nothing. I was in prison during that time. It was just that you’d break out all over, and you just didn’t have anything. You were lucky you could wash it. Q. Were there any major surgical operations performed over there? A. Those three (3) on Cass Smith. A. They had some fellows that broke their legs, but I don’t know about that. Q. Anything else about Wauwilermoos? A. My pilot, 2nd Lt. Winston Irwin, came back from there first. He was thrown in on March 28, 1944 and came back a prisoner and he stated something about (2) Russians getting killed and afterwards when I got there the same story came up again and I heard it from prisoners that had been around there for months. The story as I heard it was that the Russians were having a little trouble between themselves and were talking loud and making a lot of noise. They were arguing Communist Russia and some other kind of Russia and the guards came in and told them to shut up and the Russians told them to shut up and the guards siced a dog on them and one of the Russians took a board and hit the dog over the head and killed it and then the guards immediately turned their guns on them and shot them. Q. Do you know the names of the Swiss Commandant of Adelboden, Davos, Wauwilermoos, Les Diabluet and Coppettes? A. Captain Kramer was the Swiss Commanding Officer of Adelboden and Davos. He was a very fine gentleman. He understood the American point of view and was a well-liked man by all the fellows. He had been in the Swiss Air Force for twenty seven (27) years. I can’t remember the name of the Swiss Commandant at Wauwilermoos. He was about 5’9” tall and weight about 250 lbs. and most of his weight was lodged in his stomach. I was said that he was an officer in the French foreign legion and he always carried a riding crop. He was very sloppy with his dress. He was about 45 years old and he had light brown hair. Q. Do you know the names of the guards? A. No, I can’t recall them. Q. Can you describe any of the guards? A. Most of them were very pro-Nazi it seemed to me. It seemed to me that the Captain just carried out orders from higher-ups and as soon as the American dignitaries or high-ranking officers came through, such as General Leahy, everything was always just fine. We had good meals then and he’d promise to do this for the men and that for men, but just as soon as they left, he’d crack the whip again. At Les Diabluet, the Captain was a big heavy set man about 6’ tall and he weighed about 240 lbs. Two (2) of our boys were picked up trying to escape from there and he had twenty five (25) guards guarding these two (2) men with dogs and sub-machine guns and they marched them through the town of Les Diabluet and made them the laughing stock. The Mayor of the town got hold of these men and reported it to Bern that they shouldn’t do such things to the American airmen. I don’t know the Major’s name, but he had black hair and he was poorly built and most of his build was around his stomach. He had no distinguishing scars or marks. Q. How about the Commandant at Copettes? A. There was no officer in charge there. We just had the Swiss SS or Gestapo. It was the same as our MP’s. Q. Do you recall the names of any of the guards? Q. Do you know the names of any of the guards at Les Diabluet? Q. Did you have any American Commanding Officers at these camps? A. At Davos and Adelboden we usually had an American officer designated as officer in charge. Major Strader was at Adelboden and Capt. McGuire was the one at Davos. He was a West Point man. Q. How about the Commanding Officer at Wauwilermoos? A. We didn’t have any there. A. At Davos we were more or less placed in a German rest camp and the Germans seemed to come and go as they pleased. For recreation we were allowed to play ball and stuff like that and we were always being told to shut up and not to make so much noise. Coming from Adelboden to Davos, outside the railroad station an individual came up and was talking to us in German and I said “Nicht Sprechen Sie Deutch.” My opinion of the German Swiss was very pro-Nazi. Through information obtained while I was over there and through talking to different people there, it was my understanding that the Swiss had six hundred thousand (600,000) people working in the German War industries. Q. What proof do you have of that? A. That’s hearsay, but a Mr. Heide who was some big businessman who had his business in Zurich, and he seemed to be quite well known around there. When he would come up to Davos for a holiday and understood some of his American boys had been in this prison he met Colonel Probst who was a big guy in the Swiss Government. According to his story he had met this Colonel and had jumped him about the prison camp they kept the Americans in and the Colonel told him it was none of his damned business and if he wanted to run the Government, they’d thrown him in prison too. He stated to me that the Swiss at one time had six hundred thousand (600,000) men working in the German War Industries, and that’ definitely known because men from our internment camp at Davos went visiting factories throughout the manufacturing area throughout Zurich and they had big shells and things that were made for German guns and when the asked questions about it, it was more or less stated right there they were made for the Germans. A. At Wauwilermoos men were put in solitary confinement for tying to escape and it was a little bit of a room about 10’ x 10”. There were no blankets and nothing to sleep on but a cement floor. There were only a couple in the room and they were just served water and bread. One guy was in there for twenty five (25) days or so. I can’t remember his name, but he was an American S/Sgt. There were no lights in there either. Q. Did he show any ill effects when he came out? A. He was in awful shape. I’d say if a man stayed in there for a month, there was a possibility of him coming out dead in my opinion. The American Foreign Minister saw that too. Q. Who was the American Foreign Minister over there? A. Mr. Harrison and he had his headquarters in Zurich. I, Wallace O. Northfelt, of lawful ago, being duly sworn on oath, state that I have read the foregoing transcription of my interrogation and all answers contained therein are true to the best of my knowledge and belief. I, Robert A. Crone, Captain, A. C., (serial # omitted), certify that 1st Lt. Wallace Orville Northfelt (serial # omitted), personally appeared before me on 17 September 1945 and testified concerning War Crimes; and that the foregoing is an accurate transcription of the answers given by him to the several questions set forth. Kind of crime: imprisonment under improper conditions. Where it happened: Wauwilermoos- Straflager, Switzerland. Who was the victim: A number of men (military). State if you saw it yourself. If you did not see it, who told you about it: Men confined to solitary confinement- very small room with cement floor- nothing to lay on- no heat. Men subsisted on water and one quarter loaf of black bread a day- men were in very poor physical condition when they were released from this confinement. Kind of crime: failure to provide Prisoners of War with proper medical care, food or quarters. Where it happened: Wauwilermoos- Straflager, Switzerland, Cropettes Prison, Geneva, Switzerland. Who was the victim: Myself and approximately 100 other men at different times. (Military personnel). State if you saw it yourself. If you did not see it, who told you about it: Confinement in buildings with no head- straw to sleep on- dirty and filthy- disease ridden. Food- I personally lost 25 lbs, during my confinement. Ferocious dogs used in some instances. In cases of trying to escape firing of rifles and machine guns at men. Medical attention in case of sickness nil. Most all these 100 men either had skin diseases, dysentery, gingivitis at times. Our confinement was with all different types of criminals and prisoners- political refugees, etc.